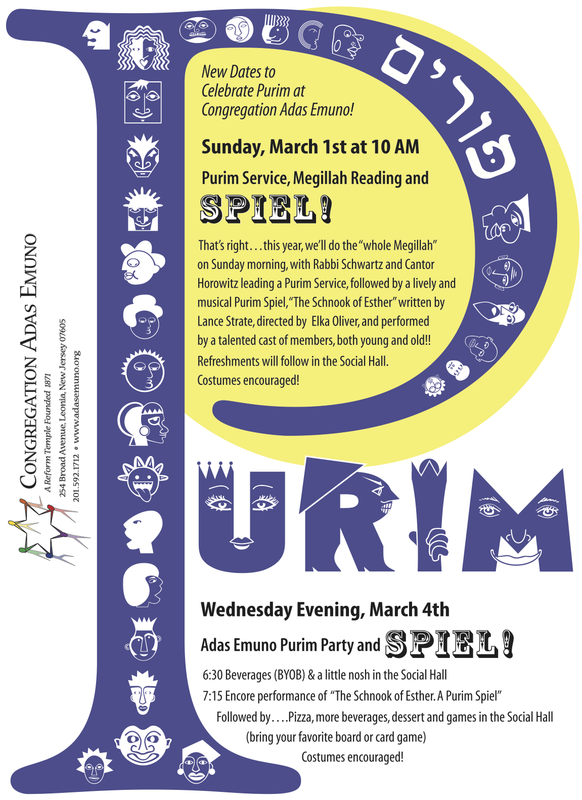 Come join in the joyous celebration of our Purim holiday at Congregation Adas Emuno! It's a holiday so nice, we're celebrating twice, first with the whole megillah of a Purim service, songfest, and spiel on Sunday morning, and second with a Purim party on Wednesday evening! You won't want to miss either one of them! And both on Sunday morning and Wednesday evening, we encourage you to bring boxes of pasta to use as groggers, so that afterwards they can be donated to the Center for Food Action. Purim may be the Jewish counterpart to Mardi Gras, but social action is never far from our minds! Please note a correction to the schedule for Wednesday evening. We'll be starting a little later, more like 7:30 PM, with pizza, snacks, and beverages. And the encore performance of the Purim spiel, The Schnook of Esther, will begin at 8:30. See you then and there! It says much about the age that we live in that so many of us first learned of the terrorist attacks in Paris on January 7th through Twitter, and that the slogan that came to represent much of the international response to the massacre originated as an image tweeted by French artist and music journalist Joachim Roncin, and soon morphed into a hashtag that rose to the top of the day’s trending topics, and has become one of the most popular hashtags in the history of that social network. I am referring, of course, to Je suis Charlie, or in hashtag form, #jesuischarlie, and its English version, #iamcharlie. Some followed up on this formula with the variations Je suis Ahmed or Je suis Ahmed Rabet, to acknowledge the Muslim police officer who was so brutally murdered in the attack on the French satirical newspaper Charlie Hebdo, and as a subtle reminder that the terrorists are not representative of Muslims in general. Others added Je suis Juif, meaning I am Jewish, to recall the fact that four hostages were murdered in a kosher supermarket, in addition to the 12 killed at the offices of the Parisian periodical. (Several of them also were Jewish.) Members of the Jewish community in France and abroad were encouraged by the appearance of Je suis Juif signs and hashtags, especially as the slogan was displayed by some French Muslims, although there has also been some criticism that it was not shared widely enough. Another variation on Je suis Charlie, coming from the far right in France, was Je suis Charlie Martel. The reference is to Charles Martel, the leader of the Franks and the grandfather of Charlemagne, who introduced the stirrup and with it mounted shock combat (of the sort used by knights in armor on horseback wielding lances). That innovation allowed his outnumbered army to resist an invasion from the Islamic empire’s Umayyad caliphate back in the 8th century. Considered the savior of Christendom and a progenitor of the feudal system that brought order to Europe in the wake of the decline of the Rome’s imperial authority, he was given the cognomen Martel, the French word for hammer, after his victory, following the archetype of Judah Maccabee. Outrage against the attacks has not been universally shared, however, and some have shown their support of the terrorists with the Twitter hashtag #IamKouachi, in reference to the brothers who carried out the Charlie Hebdo attack, while a British member of Parliament tweeted Je suis Palestinian. A less extreme expression of disagreement has been the hashtag #JeNeSuisPasCharlie, meaning, I am not Charlie. This counterslogan has been used to express the view that Charlie Hebdo’s publication of cartoons making fun of the Islamic prophet Muhammad was disrespectful to Muslims, without necessarily condoning the terrorists’ violent response to it. It has been used by news organizations to justify their decision not to republish or display those cartoons. And it also has been invoked as a protest against the fact that so many other acts of violence and bloodshed occurring outside the West have been ignored by journalists and social media participants. In a New York Times op-ed called I am Not Charlie Hebdo, David Brooks argues that if anyone had tried to publish the content of the satirical newspaper on any U.S. campus today, it would have been accused of engaging in hate speech and shut down by the university’s administration. Moreover, Brooks points out that “it is inaccurate for most of us to claim, Je Suis Charlie Hebdo, or I Am Charlie Hebdo. Most of us don’t actually engage in the sort of deliberately offensive humor that that newspaper specializes in.” While characterizing the magazine as sophomoric, indeed juvenile in its humor, and puerile and insulting, he maintains that ridicule and provocation play an important role in any community, and that healthy societies should be tolerant of all forms of speech. They should not adopt codes of political correctness, as many of our institutions have, he says. As Brooks suggests, taken literally, Je suis Charlie seems a bit absurd, but of course the slogan is not meant to be taken literally. It is an expression of support and solidarity, no doubt fashioned after President John F. Kennedy’s famous quote, part of a speech delivered in West Berlin in 1963, in response to the building of the Berlin Wall by the Communist government of East Germany: “Ich bin ein Berliner,” meaning, “I am a Berliner.” The ambiguity about what exactly is meant by the verb “to be” is what gives this declaration its powerful effect, but it is that same ambiguity that Brooks calls into question. It is an ambiguity that brings to mind another famous quote from an American president, Bill Clinton: “It depends on what the meaning of ‘is’ is.” This was said in defense of his earlier statement about Monica Lewinsky: “There’s nothing going on between us.” (That is arguably true if “is” is limited to the present moment and not inclusive of what “was” going on in the past.) In the context of a grand jury investigation, the remark came across as invoking nothing more than a legal technicality, but in fact it reflects one of the most problematic elements of our language. In the approach known as general semantics, the problems posed by the verb “to be” long have been acknowledged. Simply put, the word “is” tends to imply a relationship of identity, of interchangeability, projecting all of the characteristics of one thing onto another, which is why Brooks objects to the slogan Je suis Charlie. Holding the emotional impact aside, it would be more accurate to say that I sympathize with the staff of Charlie Hebdo and their families, I grieve for the victims of the terrorists attacks, and I unequivocally support freedom of speech and the press. Because we tend to respond to the word “is” as if it means “equals,” as if it means the same thing as “one plus one is two,” some general semanticists have suggested avoiding the verb “to be” altogether, with all tenses and traces of the verb eliminated. While this may seem like an extreme measure, substituting verbs like sympathize, grieve, and support for is, am, and are does result in more accurate statements. It also generally yields better writing, forcing us to use more active verbs. This is not to discount the simple power of the ich bin/je suis/I am quotes, but to understand that they are the exception rather than the rule. To say that the Kouachi brothers are terrorists is to imply that that is all we need to know about them. We absolutely must condemn them as terrorists, and do whatever is in our power to prevent such acts from occurring again. But we do ourselves a disservice by reducing them down to a simple label and a simple equation, when we desperately need to understand the complexities of such violent activities. In the aftermath of the attacks, the statement that Islam is a religion of peace has been repeated countless times, and while we may applaud the sentiment behind it, it is as misleading as saying that Islam is a religion of violence, as misleading as making similar statements about Judaism, Christianity, or Buddhism. Substituting other verbs, such as preaches and promotes, would be helpful, but general semantics also would recommend dealing with more concrete terms. Islam is an abstract concept (so is Judaism, Christianity, or Buddhism), and it helps to use more concrete terms, to refer to specific individuals and groups, statements and texts, and especially, actions. Modernity, and with it the establishment of the State of Israel as a Jewish homeland, has led to much agonizing over the question of who is a Jew. And while there are issues we grapple with concerning Jewish identity, to a significant degree, the problem may be in our verbs, not ourselves. The answer to the questions of “Who is a Jew?” and “Who is Charlie?” would depend on what the meaning of “is” is. It is significant to note that this is a problem that does not exist in the Hebrew language, at least not in the present tense. There are no words for is, am, and are, and the verb lihiyot, “to be,” is conjugated only in the past and future tenses. It is a quality that Hebrew shares with several other languages, including Arabic. While it is far from a cure for our many linguistic maladies, it should serve to point us in the right direction. And it is consistent with Jewish ethics to say that what really matters is not so much what someone is, but what someone does. And that includes standing up for the right of free expression and religious affiliation. And that includes defending the right to live in peace and free from terror. As a follow-up to our previous post by Adas Emuno Trustee Doris White, Poetry is Alive and Well at Adas Emuno, and with the monthly meeting of our Poetry Garden group coming up this Sunday, February 8th, at 7 PM in our temple social hall (the group meets every 2nd Sunday evening), it seems only appropriate that we take this opportunity to recall the Jewish-American poet, Muriel Rukeyser, who passed away on February 12th, 1980, at the age of 66. A political activist with a deep commitment to social justice as well as a poet of no small renown, Rukeyser attended the Ethical Culture Fieldston School in the Bronx, then Vassar College and Columbia University. In addition to her poetry, she also wrote several plays, including one on Houdini, and published a number of prose works as well. According to her Wikipedia entry, she is "best known for her poems about equality, feminism, social justice, and Judaism." As for our Poetry Garden group, here's the link to the original blog post with all of the meeting dates: Poetry Garden. And when you go to that earlier entry, you may notice that the quote we use as a motto of sorts for Poetry Garden is from none other than Muriel Rukeyser. We call it Poetry Garden, and we meet the second Sunday of each month from 7:00 to 8:00 PM. In the spring and summer, we do actually gather in the peace garden, but as the temperatures fall, we create our own garden of words in the social hall. What better way to begin the week. Some of us come to read a favorite poem, others just to listen to the words and their music, still others are brave enough to read a poem or two of their own creation. The poems are thoughtful, humorous, philosophical, political or personal. It’s really a lovely hour spent with the sounds and themes of poetry. As Christopher Frey put it, “Poetry is the language in which man explores his own amazement.” Please join us. The next Poetry Garden get together will take place on Sunday February 8th, at 7 PM in our Social Hall.